The great thing about blog friends is that they can help you find all the super amazing things that are out there in Blog-land. Two such people that have never failed me are the wonderful ladies behind Taming Insanity and A Belle, A Bean, And a Chicago Dog. This Monday they certainly delivered! 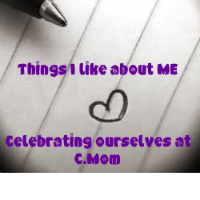 They lead me to the inspiring meme over at C. Mom, which begs the question, "What do I like about Me??" This took some pondering. Which is why I was delighted to find out that this meme was open all week. I'm much more suited for nitpicking my faults. Finding things I like about myself would require a little more thought. Or so I thought. See once I sat down and let all the negative thoughts leave my head, I realized that it's a lot easier than I thought to find the things I enjoy about myself! 10) I will always tell my friends and family (and sometimes even complete strangers) if they have something in their teeth or a booger in their nose or some other embarrassing thing going on. I'm considerate like that. 9) I shave my legs everyday. It's a part of my routine and one thing I refuse to "let go" now that I am married. 8) I'm resourceful and I'm not afraid to "teach" myself how to do something. I'm a bit of a dreamer and I have a lot of ideas so I figure, where there is a will, there is a way. Case in point, I knew nothing about digital scrap booking but taught myself how to do it and created my header for this blog. 7) I have an amazing memory...when it comes to useless crap. I'm your gal when it comes to bar trivia. 6) I can laugh at myself. And I do. A lot. 4) Though I am by no means a professional, I, if need be, can be a killer makeup artist. After all my years of reading YM and Teen magazine, I finally have something to show for it. 3) I communicate via sarcasm frequently. I also understand when sarcasm is being used, which apparently some people have a hard time with. 2) I'm creative and I enjoy the outlet I get from writing or being artistic. What do you like about yourself? ?